Benny is a Navajo and works as a guide, taking visitors into Canyon de Chelly (pronounced Canyon de Shay) in eastern Arizona. Benny grew up in the canyon, and didn’t begin to learn English until he was twelve. Benny’s native language is Athabascan. Listen to the interview with Benny and answer the following questions. 1. Who speaks Athabascan in Benny’s family? 2. Do his children study Athabascan? 3. When and where do they study Navajo language and culture? 4. 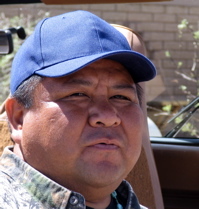 Do you think Benny is confident that his children will maintain the Navajo language (Athabascan) and culture? Why or why not? (Cite evidence from the dialogue). Kevin: Do you want your kids to learn the Navajo language? Benny: Yeah, uh huh, so that’s why I’m… I always speak to them, I always speak to them, speak my own language to them. Then my mom she speak English also. That’s why I keep letting go with my dad, my dad, he’s the only one that speaks Athabascan also, so that’s why I’m always just letting go with him. Benny: Just a class. Just one classroom or two classroom. They’re teaching Navajo cultures in there. They attend… Mostly all the students required … is required to go there… to have that Navajo culture and Navajo history.